The attachment of a virus to specific cell-surface receptors is a key event in the life cycle of animal viruses. It determines the host range and tropism of infection and initiates delivery of the genome into the cell. Once bound to a receptor, the non-enveloped viruses such as the rhinoviruses must then transfer their genome directly across a membrane into the cytoplasm for reproduction . 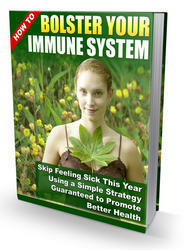 Human rhinoviruses (HRVs) are a major cause of the common cold. They are small, icosahedral viruses, 300 A in diameter, and belong to the Picornaviridae family, which includes Rhinovirus, Aphthovirus, Enterovirus, Cardiovirus, etc. Their capsid is composed of 60 copies each of four viral coat proteins, VP1, VP2, VP3, and VP4, on a T = 1 (or pseudo T=3) icosahedral lattice . The three major capsid proteins VP1, VP2, and VP3 all have the same basic eight-stranded P-barrel fold and a molecular weight of around 30 kDa. VP4 is a small protein located inside the capsid. The capsid encloses a single positive RNA strand of about 7000 bases. 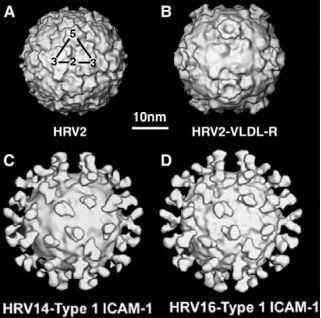 The HRV capsid has a star-shaped dome on each of the five-fold axes surrounded by a shallow depression or "canyon" and a triangular plateau centered on each three-fold axes and around each five-fold axes (Fig. 1). A distinctive feature of VP1 is that it has a "pocket" or hollow within the P-barrel that is accessible from the exterior of the capsid. This hydrophobic pocket located at the base of the canyon is frequently occupied by a natural pocket factor, a fatty-acid-like molecule. This pocket factor is believed to stabilize the virus during its spread from cell to cell . With one exception, HRVs are classified into a major group and a minor group based on their specificity for cell receptors (Fig. 2). The major group HRVs bind to the intercellular adhesion molecule-1 (ICAM-1) , which belongs to the immunoglobulin superfamily. ICAM-1 plays an important role in cell-cell interactions and contains five immunoglobulin-like domains. The minor group HRVs bind to members of the low-density lipoprotein receptor (LDL-R) family [5,6], which internalize LDL particles but also mediate the transport of macromolecules into cells by receptor-mediated endocytosis (Fig. 3). The ligand-binding amino terminus of the LDL receptors all contain various numbers of imperfect repeats of approximately 40 amino acids. These rigid ligand-binding domains are linked by four to five amino acids which confer some flexibility. 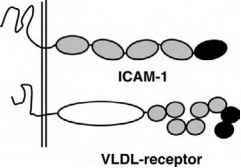 Both ICAM-1 and the LDL receptors appear to bind their ligands by electrostatic interactions. HRV87 alone uses an unidentified sialoprotein as receptor  for which the receptor site is unknown. The major group HRV89 has the capacity to evolve under the pressure of passage in vitro to use an alternative receptor and even to infect cells devoid of its normal ICAM-1 receptor . mutating to give a viable virus that escapes immune surveillance . This is an interesting example of a highly plausible hypothesis that is not quite correct. Binding of ICAM-1 to major group HRVs, such asHRV14, initiates rapid uncoating at physiologic temperature without the need of any cellular machinery . In contrast, binding of LDL receptors to minor group HRVs, such as HRV2, does not directly catalyze decapsidation , and the subsequent internalization into acidic endosomal compartments is required for the transfer of the viral RNA into the cytosol  (Fig. 3). 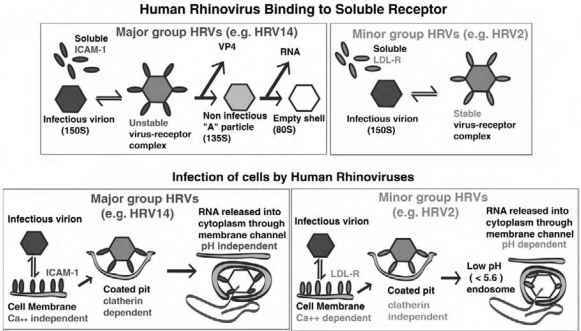 Figure 2 Schematic representation of the two proteins known to act as rhinovirus receptors. ICAM-1 contains five immunoglobulin-like domains and attaches to the major group HRVs by the N-terminal domain depicted in black. The ligand-binding amino terminus of the VLDL receptor (one of the LDL receptor family) contains eight imperfect repeats; two of these repeats bind to the minor group HRV2. Figure 3 Schemas for attachment of soluble receptors to major and minor group HRVs and for the infection of cells by HRVs. proposed that ICAM-1 binds to the major group HRVs in a two-step process, as shown in Fig. 4. In the first step, ICAM-1 binds essentially to the base and one side of the canyon in the conformation as observed in cryo-electron microscopy reconstructions. The second step would then consist of expulsion of the natural pocket factor, as the ICAM-1 molecule binds to the other side of the canyon. This would induce the VP1 to flex at the canyon, moving away from the five-fold axis and thus opening the pentameric vertex. Because the binding site of the HRV2 receptor lies entirely on the dome on the five-fold axis and does not overlap the canyon or the pocket in the canyon at all, the mechanism must be quite different. The binding of VLDL-R to HRV2 as seen by cryo-electron microscopy is probably also the first step in a two step process . The first step of receptor binding simply ensures that the HRVs are anchored to the membrane. The second step (i.e., expulsion of the pocket factor and flexing of VP1 to open a passage for the exit of the molecule of RNA) is then triggered by the low pH (5.6) in the endosome (Fig. 4). It is generally believed that the RNA exits along one of the five-fold axes. As the capsid opens, the VP4 and the N-terminus of VP1 are externalized. It has been hypothesized that both VP4 and the N-terminus of VP1 are inserted into the membrane in order to facilitate passage of the RNA across the membrane . Antiviral compounds, such as the "WIN compounds" produced by the former Sterling Winthrop Research Institute, bind in the VP1 pocket. In many major group viruses, this induces a deformation of the canyon which causes a loss of receptor binding. It also stabilizes the capsid; however, in minor group viruses these antivirals do not affect receptor binding , and their antiviral effect is based on their stabilizing effect only. This behavior is in accord with the fact that the binding site of LDL-R on minor group viruses does not overlap the pocket at the base of the canyon. 1. Rueckert, R. R. (1996). Picornaviridae: the viruses and their replication, in Fields, B. N., Knipe, D. M., and Howley, P. M., Eds., Fields Virology, pp. 609-654. Lippincott, Philadelphia, PA.
2. Rossmann, M. G., Arnold, E., Erickson, J. W., Frankenberger, E. A., Griffith, J. P., Hecht, H. J., Johnson, J. E., Kamer, G., Luo, M., Mosser, A. G., Rueckert, R. R., Sherry, B., and Vriend, G. (1985). Structure of a human common cold virus and functional relationship to other picornaviruses. Nature 317, 145-153. 3. Hadfield, A. T., Lee, W. M., Zhao, R., Oliveira, M. A., Minor, I., Rueckert, R. R., and Rossmann, M. G. (1997). The refined structure of human rhinovirus 16 at 2.15 angstrom resolution: implications for the viral life cycle. Structure 5, 427-441. 4. Greve, J. M., Davis, G., Meyer, A. M., Forte, C. P., Yost, S. C., Marlor, C. W., Kamarck, M. E., and McClelland, A. (1989). The major human rhinovirus receptor is ICAM-1. Cell 56, 839-847. 5. Gruenberger, M., Wandl, R., Nimpf, J., Hiesberger, T., Schneider, W. J., Kuechler, E., and Blaas, D. (1995). Avian homologs of the mammalian low-density lipoprotein receptor family bind minor receptor group human rhinovirus. J. Virol. 69, 7244-7247. 6. Hofer, F., Gruenberger, M., Kowalski, H., Machat, H., Huettinger, M., Kuechler, E., and Blaas, D. (1994). Members of the low density lipopro-tein receptor family mediate cell entry of a minor-group common cold virus. Proc. Natl. Acad. Sci. USA 91, 1839-1842. 7. Uncapher, C. R., DeWitt, C. M., and Colonno, R. J. (1991). The major and minor group receptor families contain all but one human rhinovirus serotype. Virology 180, 814-817. 8. Reischl, A., Reithmayer, M., Winsauer, G., Moser, R., Gosler, I., Blaas, D. (2001). Viral evolution toward change in receptor usage: adaptation of a major group human rhinovirus to grow in ICAM-1-negative cells. J. Virol. 75, 9312-9319. 9. Kolatkar, P. R., Bella, J., Olson, N. H., Bator, C. M., Baker, T. S., and Rossmann, M. G. (1999). Structural studies of two rhinovirus serotypes complexed with fragments of their cellular receptor. EMBO J. 18, 6249-6259. 10. Hewat, E. A., Neumann, E., Conway, J. F., Moser, R., Ronacher, B., Marlovits, T. C., and Blaas, D. (2000). The cellular receptor to human rhinovirus 2 binds around the 5-fold axis and not in the canyon: a structural view. EMBO J. 19, 6317-6325. 11. Smith, T. J., Chase, E. S., Schmidt, T. J., Olson, N. H., and Baker, T. S. (1996). Neutralizing antibody to human rhinovirus 14 penetrates the receptor-binding canyon. Nature 383, 350-354. 12. Hogle, J. M. (1993). The viral canyon. Curr. Biol. 3, 278-281. 13. Greve, J. M., Forte, C. P., Marlor, C. W., Meyer, A. M., Hooverlitty, H., Wunderlich, D., and McClelland, A. (1991). Mechanisms of receptor-mediated rhinovirus neutralization defined by two soluble forms of ICAM-1. J. Virol. 65, 6015-6023. 14. Neubauer, C., Frasel, L., Kuechler, E., and Blaas, D. (1987). Mechanism of entry of human rhinovirus 2 into HeLa cells. Virology 158, 255-258. 15. Kim, K. H., Willingmann, P., Gong, Z. X., Kremer, M. J., Chapman, M. S., Minor, I., Oliveira, M. A., Rossmann, M. G., Andries, K., Diana, G. D., Dutko, F. J., McKinley, M. A., and Pevear, D. C. (1993). A comparison of the anti-rhinoviral drug binding pocket in HRV14 and HRV1A. J. Mol. Biol. 230, 206-227.